Palm Tree Lagoon is a commercial fishery located in Ratchaburi province in Western Thailand some 2.5 hours outside Bangkok or a 2 hour drive from Hua Hin and home to various monster freshwater fish. The lake at Palm Tree Lagoon was previously immortalized in a recent Discovery channel production featuring legendary angler John Wilson and is home to a wide variety of native and imported fish species. The lake has basic facilities and is approximately 3 acres in size with varying depths down to 5 metres at the deepest parts. 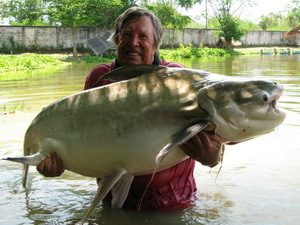 This intimate fishery boasts an impressive stock with Arapaima gigas to an estimated 200kg and some extremely large Chaophraya Catfish reported to weigh upto 96kg’s. Recent trips in the last year to this exciting venue have seen our clients catching Giant Siamese Carp to 71kgs, Mekong Catfish to 96kgs and Arapaima to a whopping 180-200kgs. In addition at least two other Mekong Catfish are present in the lake weighing in the excess of 300lbs. The previous Thai owner of palm tree lagoon had extensive fish farming experience and bred numerous Monster fish in the past which were stocked into the lake. 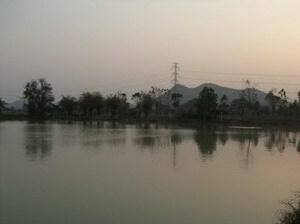 Now under new management the lake has gone from strength to strength with even more monster fish species such as Goonch Catfish now residing in its depths The remainder of the PTL stock is composed of various Carp, Catfish and predatory species both native and imported to Thailand. This venue responds well to various techniques including fishing with bait, ie live bait and deadbaits in addition to carp fishing tactics incorporating method feeders and groundbaits. Worms also score well with some of the smaller and quite often elusive species. The massive fish contained in its depths are regularly seen surfacing and showing themselves at various parts of the lake. The intimate nature of lake dictates a stealthy approach and fishing can be affected in the event of a lost fish or drawn out battle. Palm Tree Lagoon is one of several commercial fisheries in Thailand containing specimen sized Arapaima which are clearly of world record proportions. The lake can be a challenging venue but holds some truly spectacular prizes and is an ideal venue for anglers wishing to do battle with large predatory species and various Carp and Catfish species found in Asia. Basic air conditioned accommodation is available nearby the lake with extra bait available onsite at a minimal charge. Delicious Thai and Western food is also available onsite freshly cooked at the lake by owner and pro fishing guide Benny. We offer trips to this lake both guided and unguided with daily visits and multiple angling tours available throughout the year giving anglers the chance to target the large predators, carp and catfish contained in its depths. This exciting venue can be included in our tailor made angling holidays combining a trip here with one or more of our other exciting angling destinations.